The National Weather Service office in San Diego is warning of a major heat wave in San Diego that will begin on Friday. “A sprawling dome of high pressure will build over the Southwestern United States after the 4th of July, with temperatures likely to reach excessive levels by Friday and Saturday,” the weather service said. Temperatures will rise to 10 to 20 degrees above normal. The weather service is predicting highs Friday in the upper 80s along the coast and over 100 in inland areas such as Escondido, Ramona and Alpine. Mountain communities will see temperatures in the mid 90s. Borrego Springs in the desert is expected to hit 119 degrees. 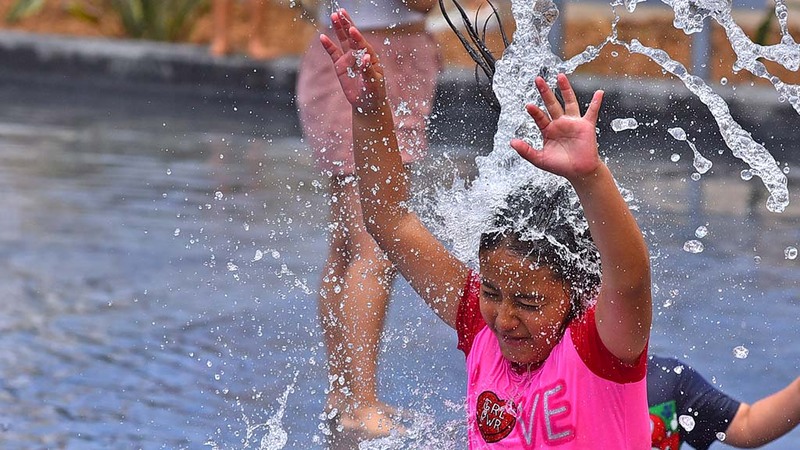 “An increase in humidity levels will likely combine with the heat to make it downright uncomfortably hot,” the weather service said, advising people to take precautions to remain cool. In addition to the heat, swells from tropical cyclone Fabio will create 6 to 8 foot surf along south-facing beaches of northern San Diego County late Wednesday through late Friday. Isolated sets of 10 to 12 feet are possible. The high surf and strong rip currents will make swimming hazardous during the period, the weather service said.